Anytime you think you've got TSA rules down is probably the moment something is going to change. 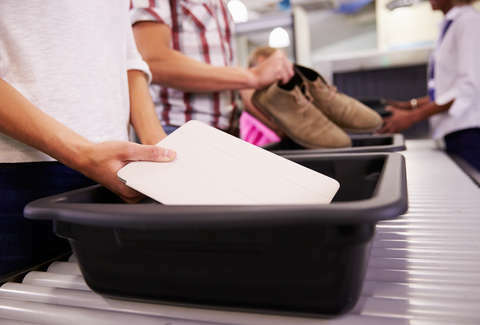 Beginning June 30, foreign airports with direct flights to the United States are requested to provide additional scrutiny to fliers carrying more than 12 ounces of powder in their carry-on luggage. The change is partly because of a plot to blow up an Etihad Airways plane in Australia last July. That foiled plot "contributed to the current focus on powders," a TSA official told CNN. Though, the representative was sure to mention that devices containing powder explosives have always been on the organization's radar. Many international airlines have already placed heavier scrutiny on powders due to that plot, according to TSA spokesman Michael England. Since TSA rules can occasionally be difficult to decipher, American Airlines issued a statement defining powder. "Powder-like substances are described as fine dry particles produced by the grinding, crushing or disintegration of a solid substance," the airline wrote. "For ease of travel, TSA recommends placing larger items in checked baggage prior to arriving at the security checkpoint," Mike Bilello, a TSA spokesman, told USA Today. "The international aviation community and industry’s actions represent collaborative approaches that greatly enhance global aviation security." Products that can fall under that category could include cosmetics, coffee, spices, baby powder, and protein mixes. Baby formula, medicine, and cremated human remains are exempt from secondary screenings, according to American Airlines. Gunpowder remains prohibited from all checked and carry-on luggage. Powders won't necessarily be confiscated if you have more than 12 ounces. You'll be requested to remove the powder for additional screening, similar to what you're supposed to do with liquids. If officers can't figure out what you're carrying, you may be asked to discard the powder or check the item. You can avoid this situation entirely by placing powders in your checked luggage. The new procedures will not impact domestic flights because stronger regulations for carry-on bags was implemented in April. Those changes require fliers to remove food, powders, and liquids from carry-on bags to avoid obstruction inside x-ray machines.